This is how ANT1 TV reported the riots that took place in the Exarchia district of Athens on 6/12/14. The journalist, Yorgos Karaivaz, have surpassed Nobelist poets and imagined himself in one of the fiercest battlegrounds of human history. Enjoy the description and ponder the reasons why a nationwide TV station would go this low to describe in this way an otherwise pretty simple news story. An interesting video was filmed last night during the extensive riots that took place after the demo in honour of 15-year old Alexis Grigoropoulos who was assassinated by a policeman on December 2008. Greek demonstrators often mention the existence of plain clothes policemen and the infiltration of agent provocateurs in demonstrations in Greece. I too used to believe that this was some kind of a conspiracy theory until I started attending demos after 2009. International media have been reluctant to report on this (with some exceptions) with correspondents finding it difficult to believe that such totalitarian practices are still being used in an EU country. But this video, filmed last night in Exarchia district of Athens and posted on YouTube by Sto Kokkino radio, shows clearly a big number of what would otherwise look like “a band of hoodies or violent rioters” passing by a team of riot police, heading towards the district’s square where anarchists had set up barricades. The Greek government does not acknowledge the use of such practices, nor is it expected to comment on the issue after the publication of this video. Upd: Here’s a second video from the same place/time (Thanks Janine Louloudi). In a response to the video posted by Chloe Kritharas, the chairman of the Union of Policemen said that the Greek Police has launched (one more) investigation about the incident. He added that according to his information by his colleagues, the first in a series of mistakes was made by the kiosk owner who refused to sell any of his products to the raiding riot policemen. He also said that the policemen have left money on the counter of the kiosk and that, normally, they should have arrested the kiosk owner in the end for refusing to serve them. Here’s the video of the Policemen Union spokesman. Today is the last weekend before Christmas. One last little hope for the shop owners to make up for the losses of another year of depression. Shops are going to be open on Sunday too. The city centre must be clean to cater for the shoppers, the army of consumers who are actually more like starving animals looking for offers, discounts, credit, installments, anything. The centre must be clean, the image of the city is what counts. We’re in such a bad situation that we can’t be bothered with what’s behind the curtain. At least we can look well. I was talking with a hotel owner at the neglected areas below Omonia square. About two years ago, despite the crisis that was already there, he had spent more than 2 million euros to turn an old building to a boutique hotel. Last year when I first interviewed him complaining about the area being neglected, about immigrants, crime, few tourists would dare to go the demo-stricken Athens and even fewer would choose his hotel for their stay. This year he sounded much happier, the immigrants were gone, the police is doing a good job patrolling the streets, none of his clients reported any thefts and, above all, tourists increased. I guess he didn’t care about the immigrants’ detention camps or the police abuse, as long as the centre is good for his business, as long as Greece’s image abroad is polished. “Tourists returned to Athens. It’s simple. We had a riot-free year as far as the Athens centre is concerned” he explained while some blocks away, in Exarchia, this very riot-free year has been certain people’s biggest disappointment. Not that they indeed hoped for a real socialist, communist or anarchist revolution but at least there should be some show of resistance, they shouldn’t look as defeated as they do now. Above all it’s the image. So they city must be clean. 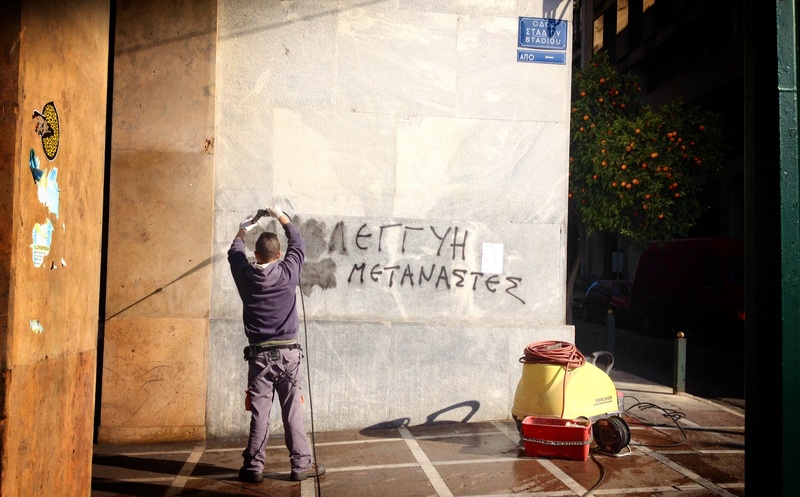 The Mayor of Athens, who only a couple of days ago called one of the city’s most vibrant, creative, young and colourful areas [Exarchia] a hub of organised crime, sent out the municipal workers on their eternal crusade against graffiti. The wall of the Bank of Greece HQ should be clean by now. This is how it looked when I passed by this morning. The graffiti was saying “Solidarity to all the immigrants”. Athens, 21 December 2013. These are the signs of these times. At the beginning, the Greek crisis was interesting just for foreign correspondents, economists and political analysts. After the first year of the crisis, I started observing an increasing interest by scholars and post-grad students who would come to Athens for a week and try to speak with as many people involved & influenced as possible. Activists followed suit. Last February I met a 20-year old anarchist from US who came to Athens and got in touch with local comrades in an attempt to carry ideas back to the Occupy Wall Street movement. In December 2012, while working with a Norwegian team of journalists, we mingled with a rioting in the anarchist Exarchia district of Athens and witnessed tens of “riot tourists”. Some were here indeed out of sincere solidarity, consciously supporting the struggling Greeks but some were obviously kids on a European city escape who, rather than throwing a coin in Rome’s Fontana di Trevi, chose to throw a stone to a Greek policeman. Don’t ask me if they made a wish in advance. In February 2012, a close relative who is now working in Middle East told me of a Ukrainian guy who visited Athens ahead of a general strike. His aim was to witness the foreseeable riots that usually accompany our strike demos. Right then I started to feel that Athens is slowly becoming a sort of a spectacle in the same way tourists visit Chernobyl for photo opportunities with radioactive plastic dolls, blood-thirsty Italians visited Bosnian trenches during the Yugoslav war or like Toshifumi Fujimoto, a Japanese truck driver who enjoys visiting war zones instead of dreamy beaches. Tourism in Bosnia kept dealing with the war. Even now, almost 20 years after, one of the major sight-seeings of the capital Sarajevo is the so called War Tunnel. A quick google search will give you several companies organizing walking tours about the civil war there. Funky Tours, to name but one, is organizing the Sarajevo Total Siege Tour. Soon humanity coined a neologism for this kind of tourism. You can look it up under the self-explicit War Tourism or even Dark Tourism, which involves travel to sites associated with death and tragedy. There is also the synonymous, but less popular in use, Thanatourism, which derives from the Ancient Greek word Thanatos. 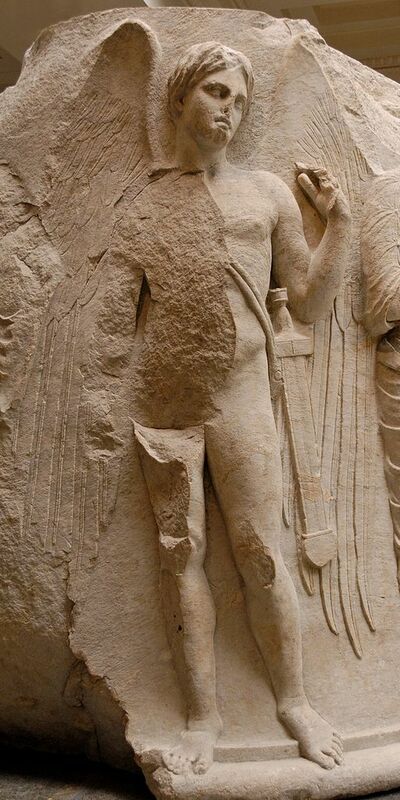 Winged youth with a sword, probably Thanatos, personification of death. Detail of a sculptured marble column drum from the Temple of Artemis at Ephesos, ca. 325-300 BC. Having all these in my mind I knew something like this was coming. Especially after last summer, when I came across the website of Political Tours, a London-based travel agency founded by former New York Times Balkans Correspondent Nicholas Wood. The travel agency’s motto was “Intelligent Travel for Inquiring Minds” and I read that they were organizing tours in North Korea, Libya, Turkey as well as a trip to the US during their elections. So guess what was their latest tour? “Greece and the Euro”, a 8-day phantasmagoria of Greek crisis, misery, unemployment, destruction and poverty. Among speeches with political analysts and journalists, their detailed programme included a “visit to Sydagma Square, where the demonstrations protesting austerity measures have culminated and where many riots have started. We see the damage done by the unrest and then move on to Ermou Street, a place were it was once impossible to find a shop to rent. Now many are empty and pawn shops are prevalent“. Depending on time and how our conversation unfolds we may end the walk in a local wine bar where we can conclude our discussion with the possible solutions and precautions for a brighter future in Greece. As we take a sip from the local Greek wine (not retsina), we will emerge with a much clearer understanding of the Greek economic crisis and its social elements. The prices for the walking tours are 70 euros per person but there is a possibility to book a private tour for 300 euros. Which, coincidentally, is a bit less than the much-talked new minimum monthly wage in this country. 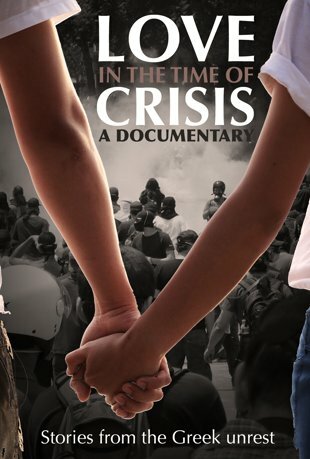 Here’s a short documentary on the social repercussions of the Greek crisis and an attempt to understand the rise of violence, but also of solidarity in Greece. It’s made by Ross Domoney, a colleague and friend from the UK who did not parachute himself to Greece for a couple of days but spent several months in Athens. Athens: Social Meltdown – Greek subtitles from Ross Domoney on Vimeo.